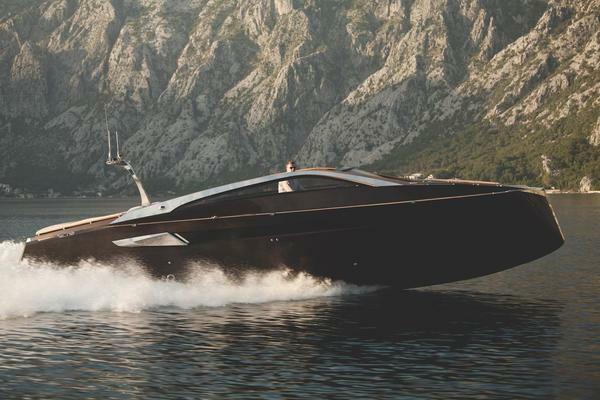 THIS VESSEL MUST BE SEEN. 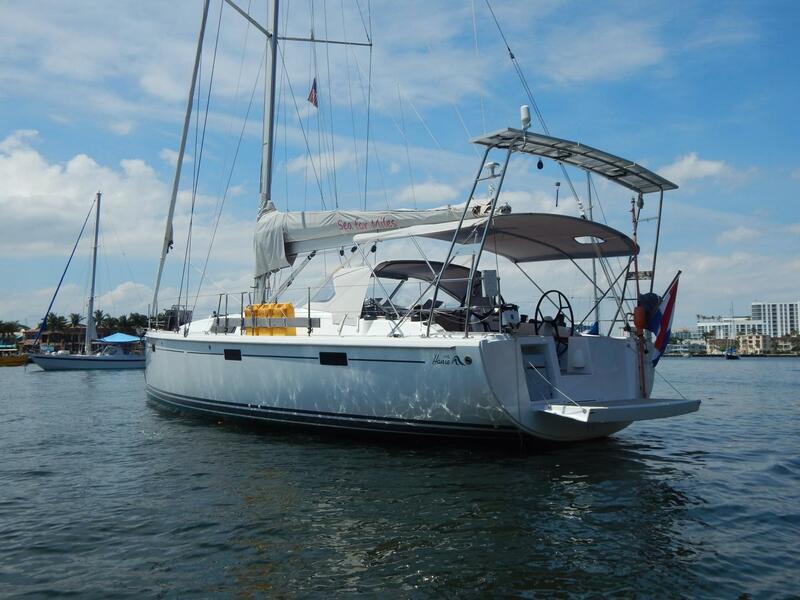 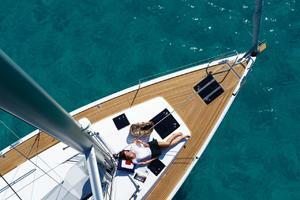 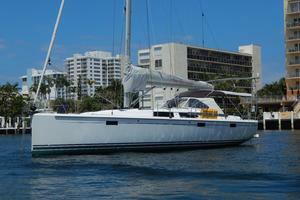 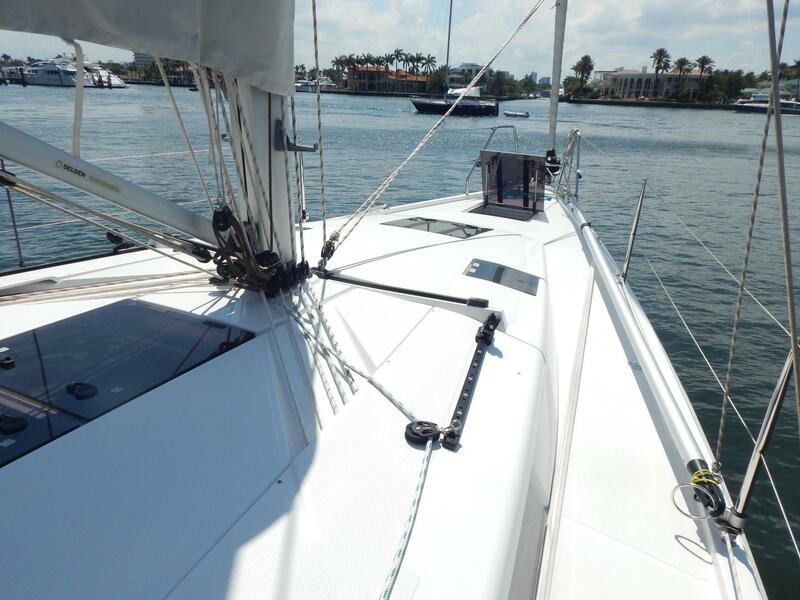 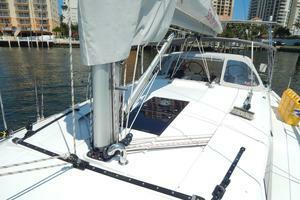 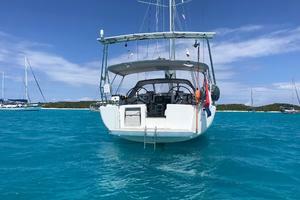 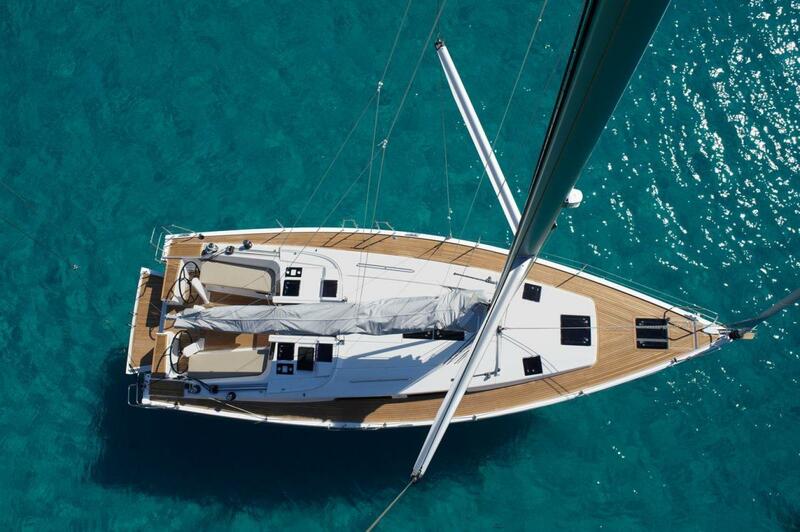 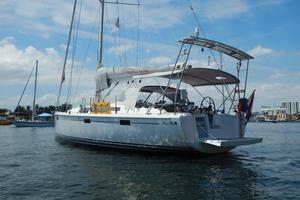 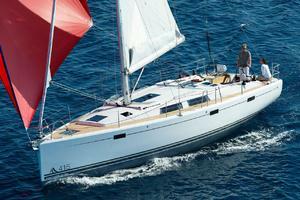 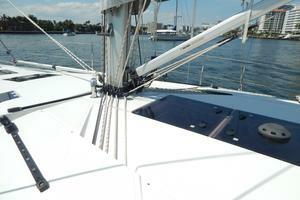 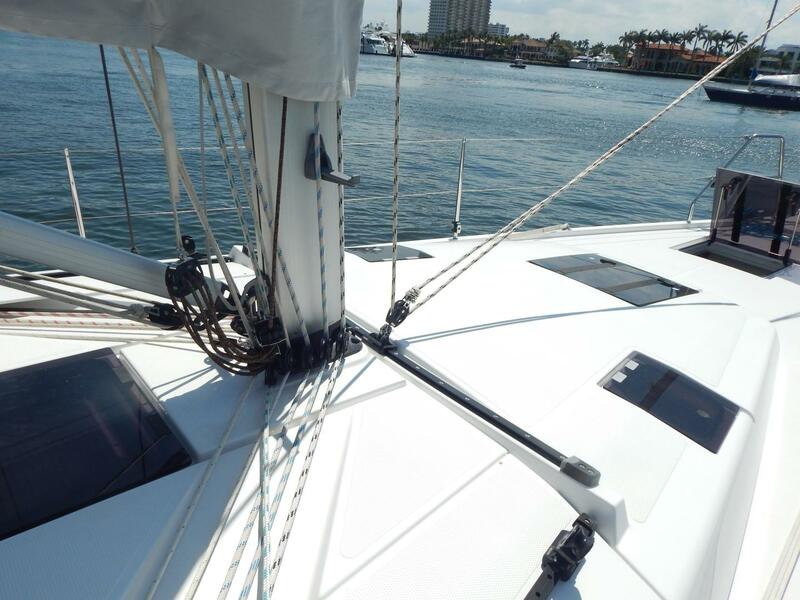 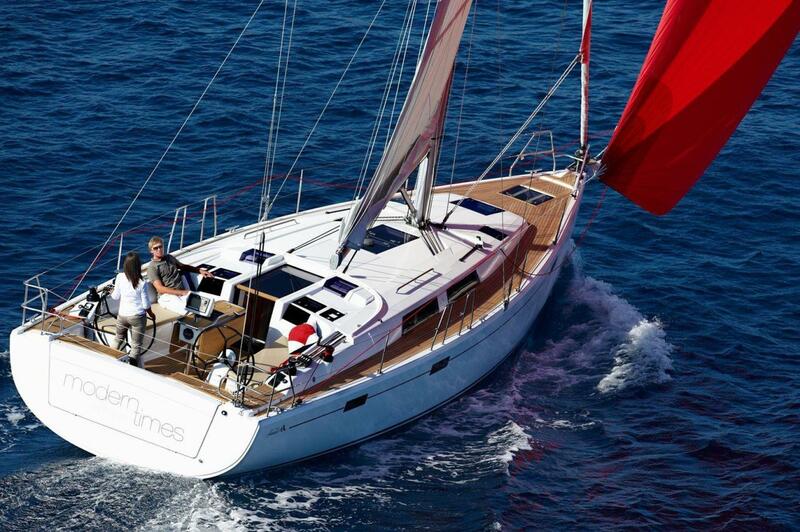 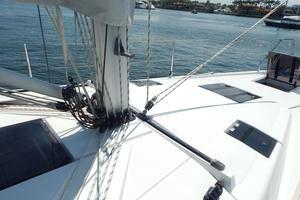 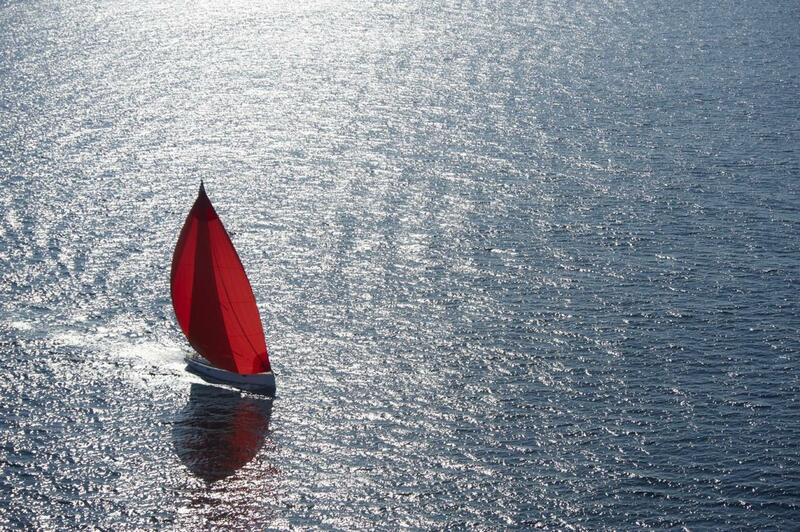 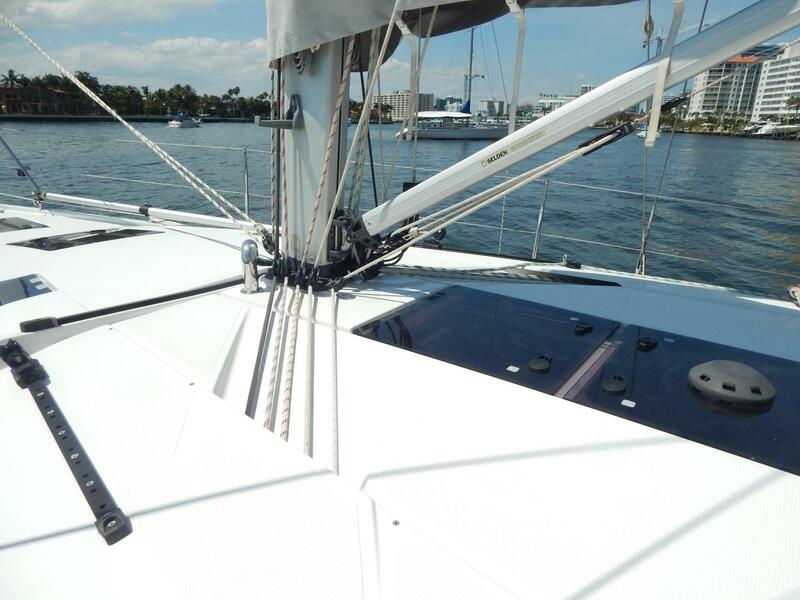 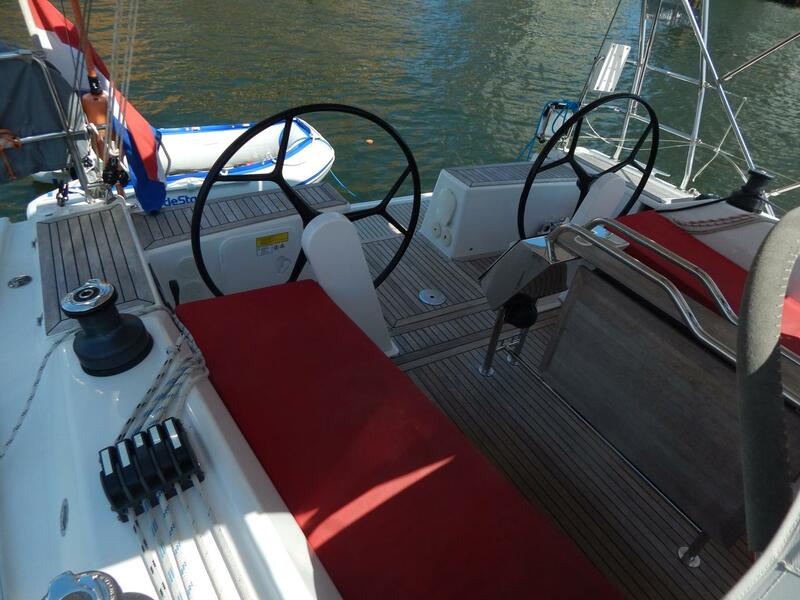 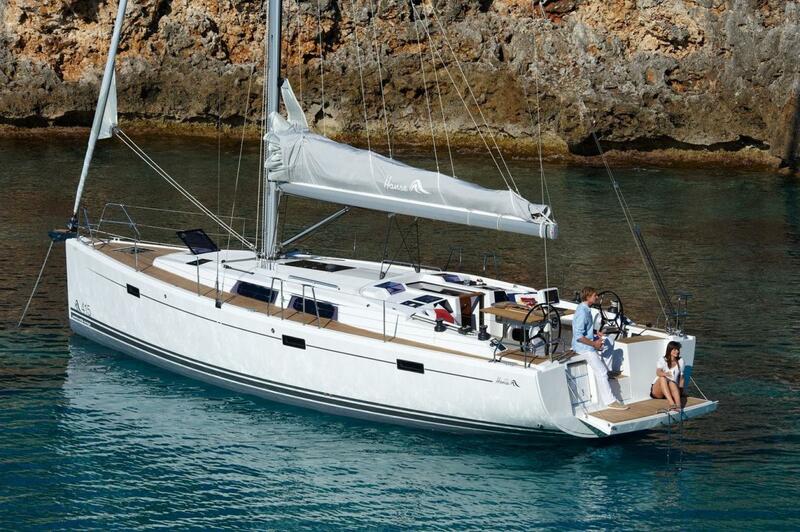 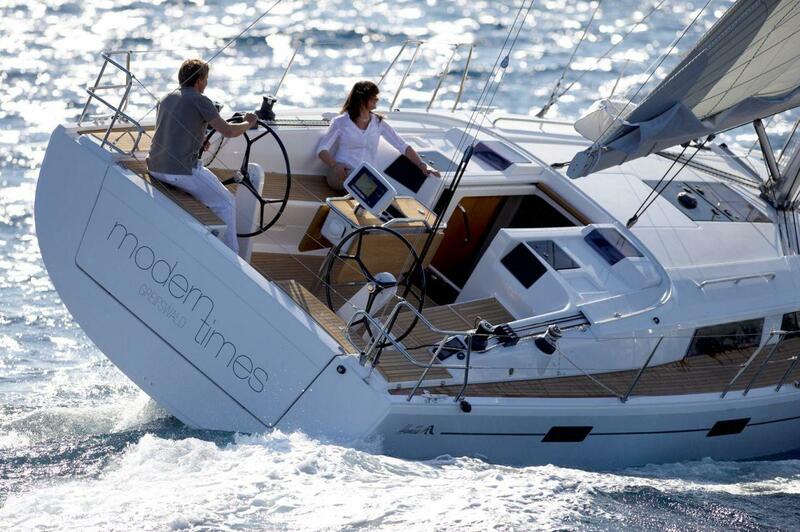 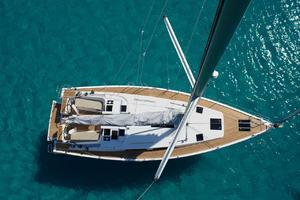 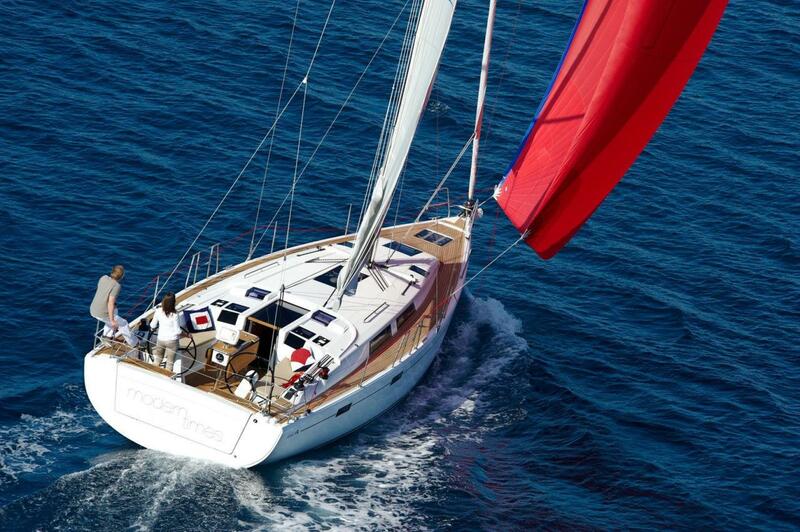 She is a thoroughly modern, well thought out sailing machine capable of exciting day sailing, or blue water cruising. She is a proven passage maker and has crossed the Atlantic on her own bottom. 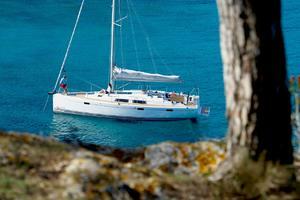 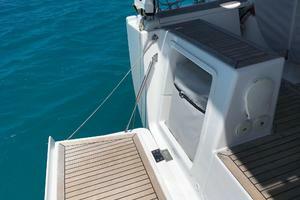 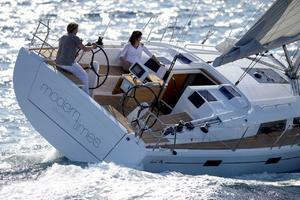 Easily sailed by one person, she also makes an ideal vessel for a couple or small family. 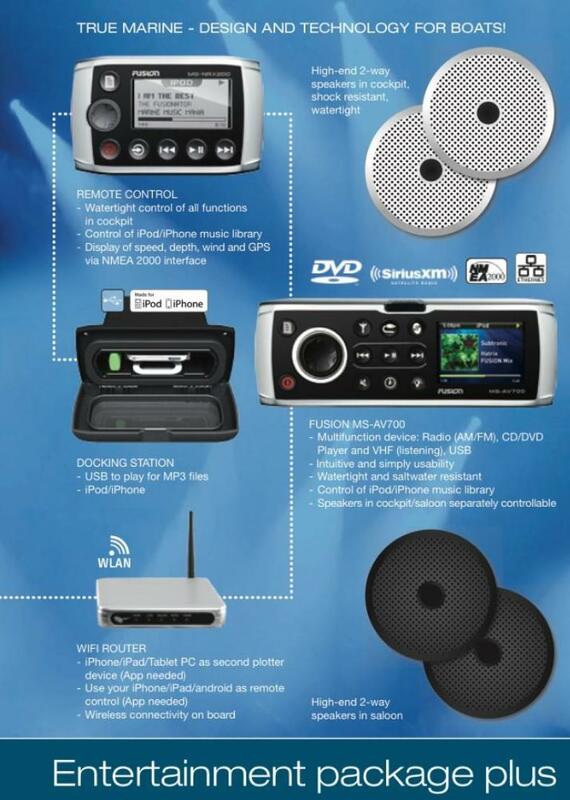 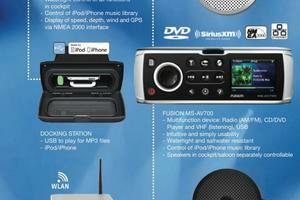 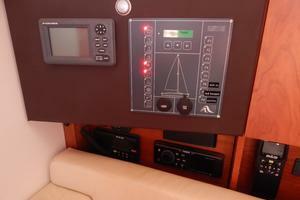 She has state of the art electronics, and all systems are in excellent condition. 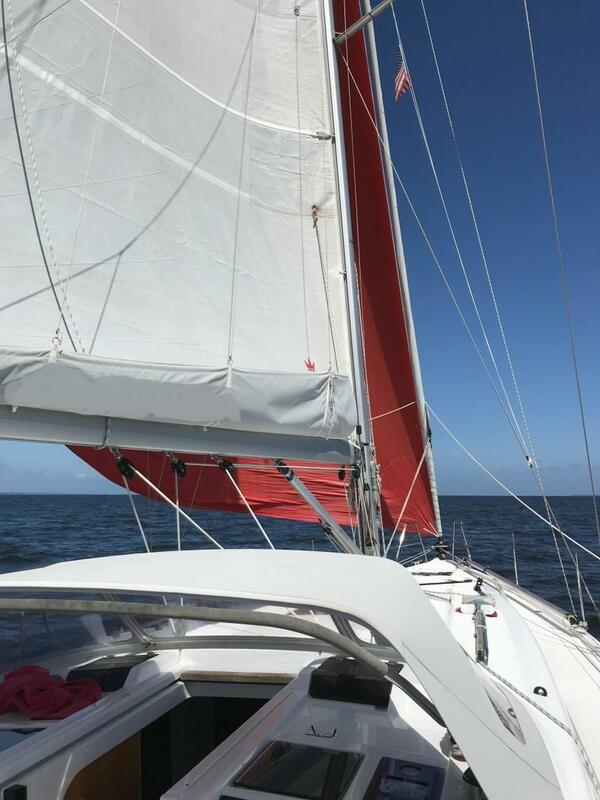 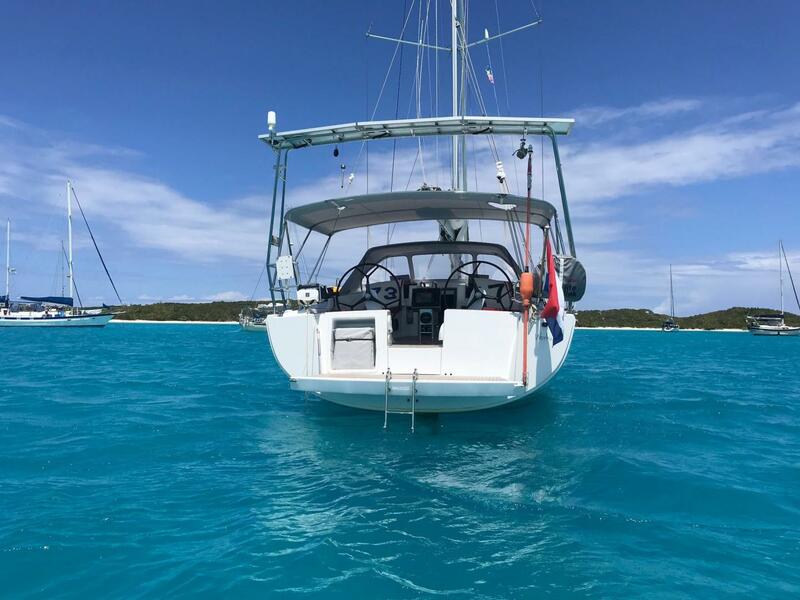 Please click “full specs” above, and contact listing broker immediately to make an appointment to see this quality sailboat. 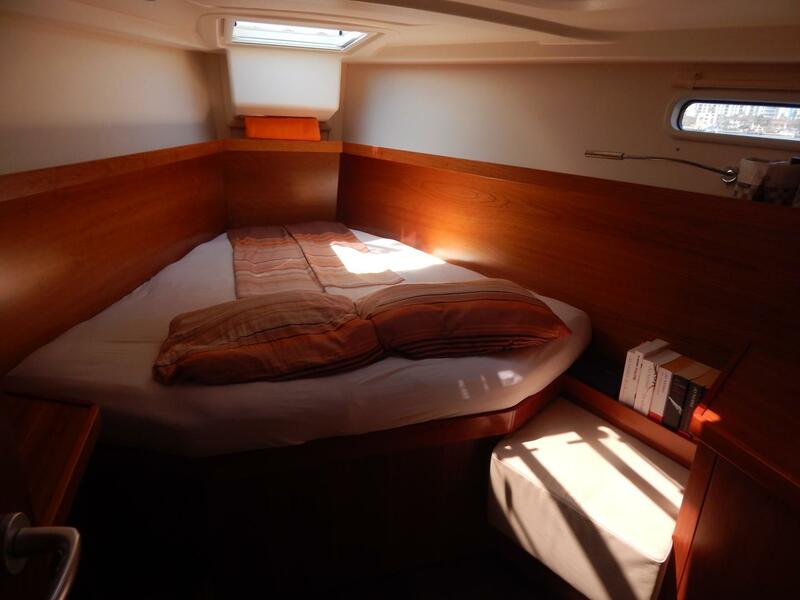 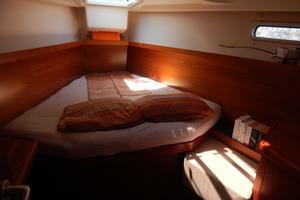 This is a Two stateroom, single head vessel. 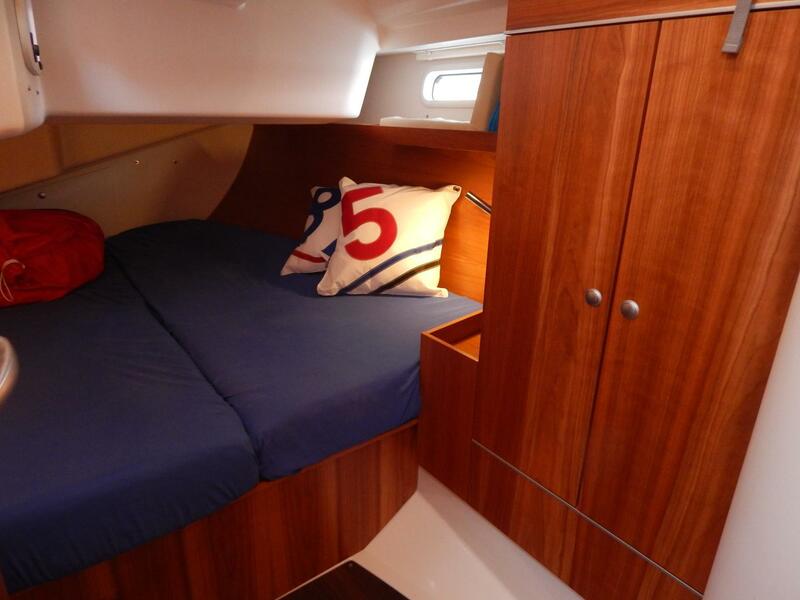 Both staterooms sleep 2 and additional sleeping accommodations can be found in the Salon for 2 additional people. 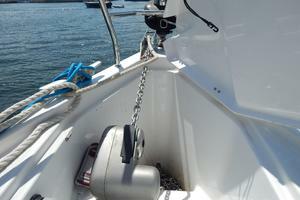 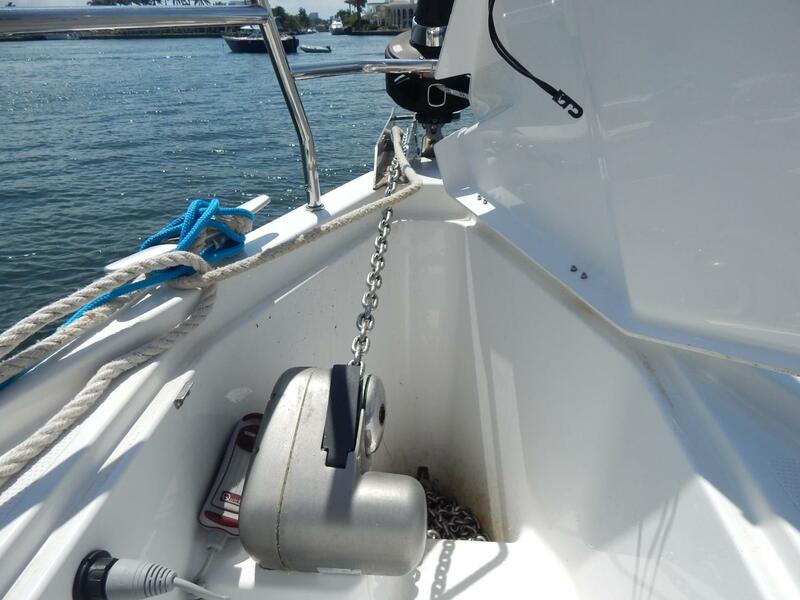 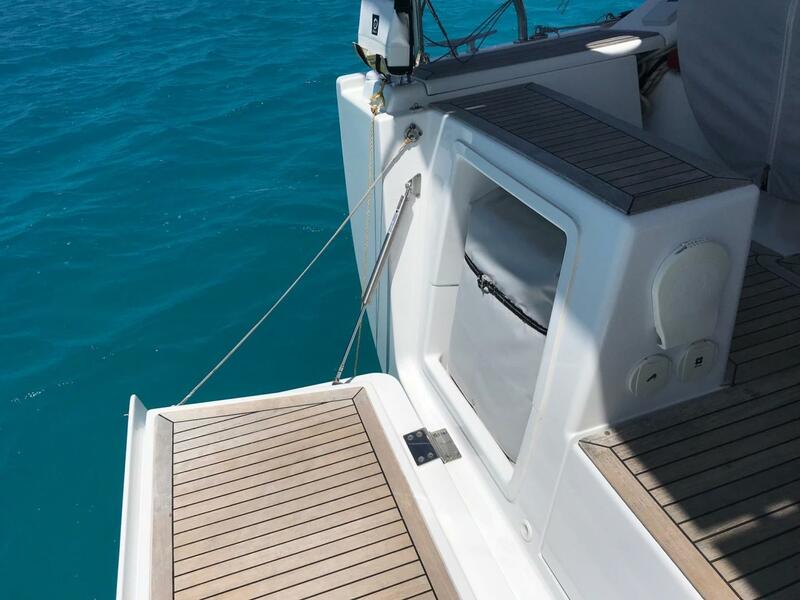 The vessel can easily be boarded from her large fold down transom when at anchor, or opening side gates in the lifelines while at a dock. 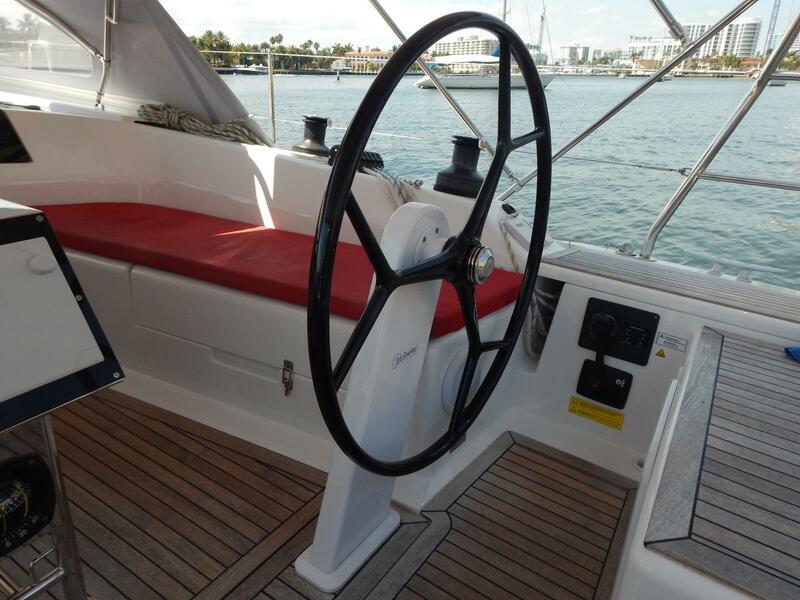 Her cockpit is open and made more spacious with the twin steering wheels that allow easy passage fore and aft. 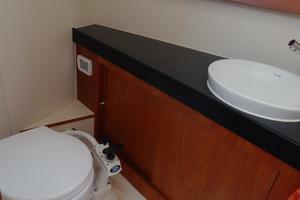 The main Salon is entered via a drop-down hatch board, that eliminates the need to store individual hatch boards. 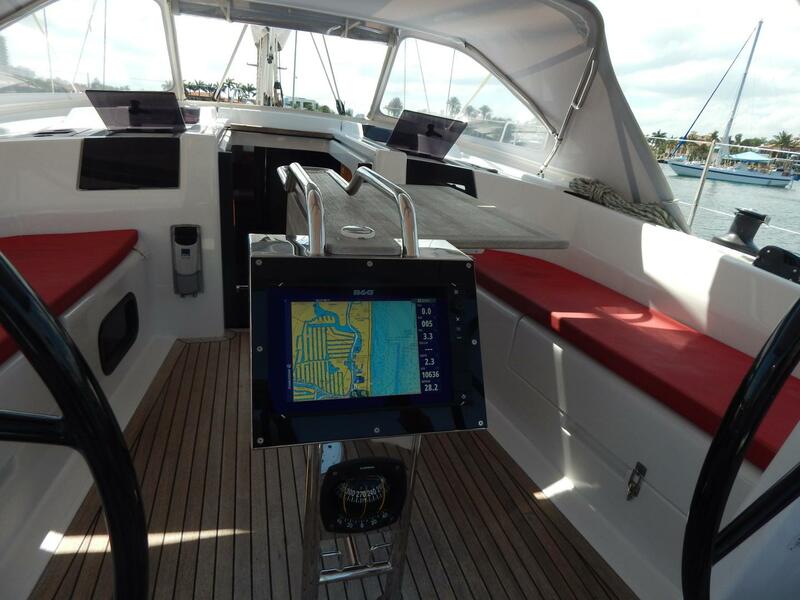 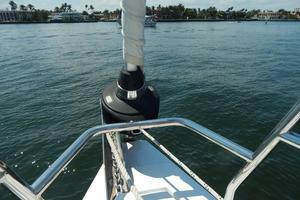 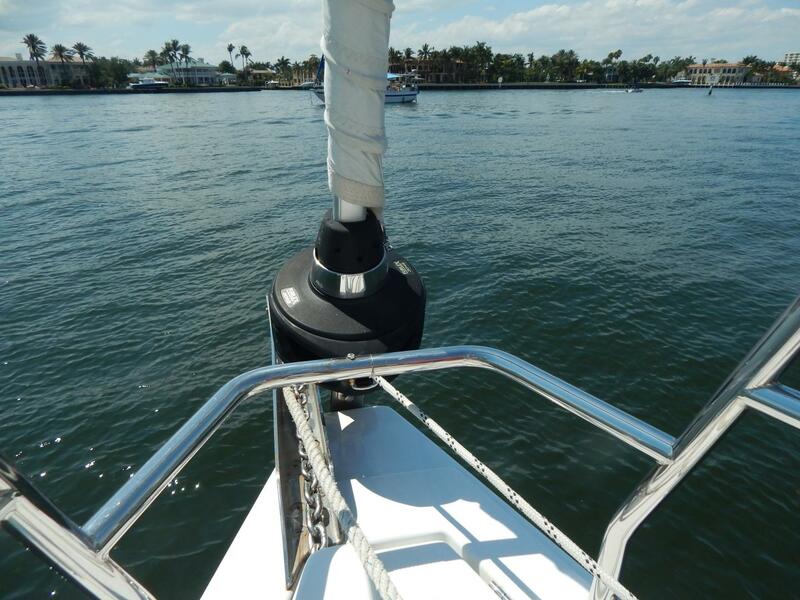 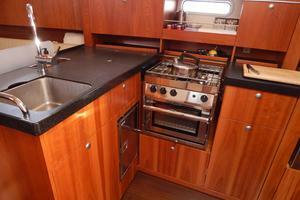 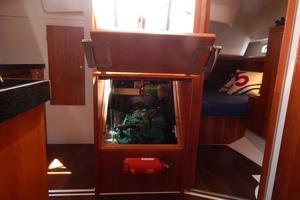 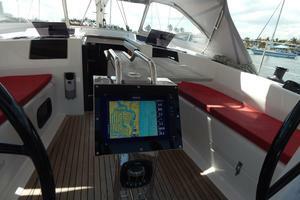 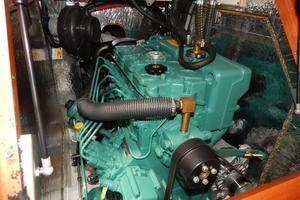 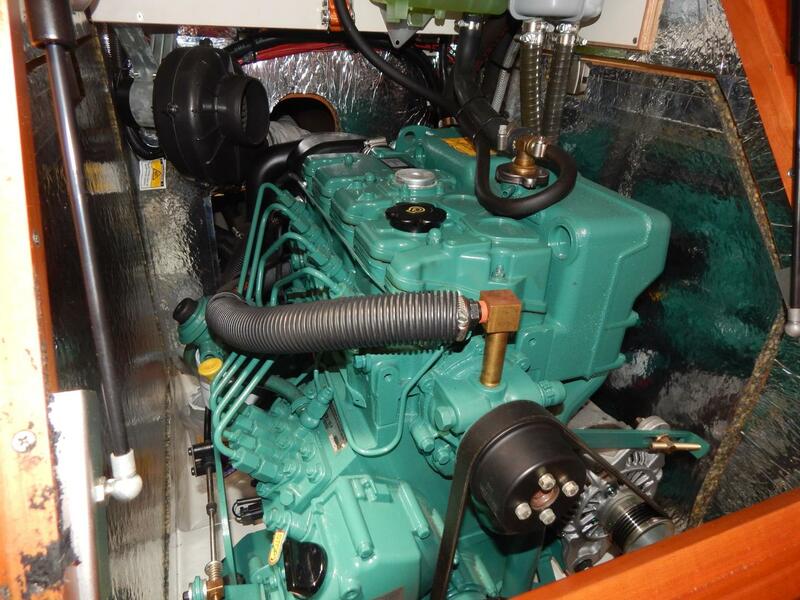 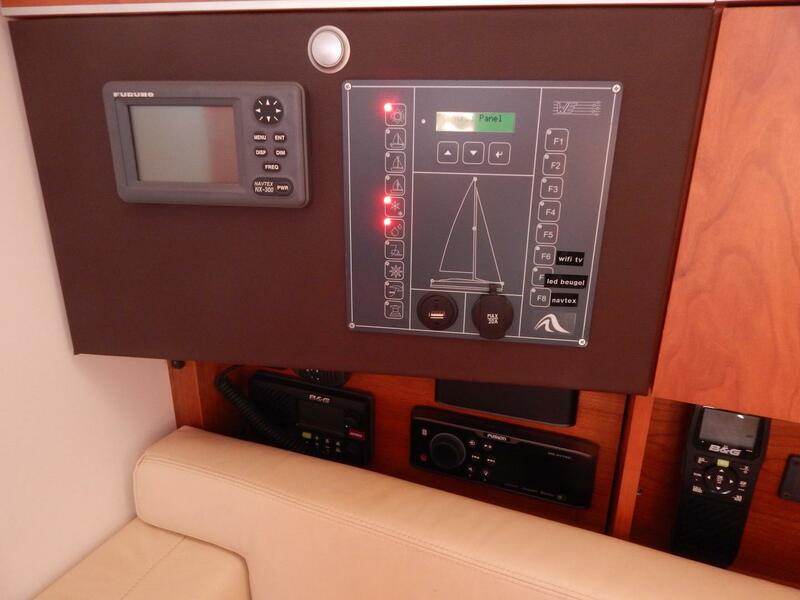 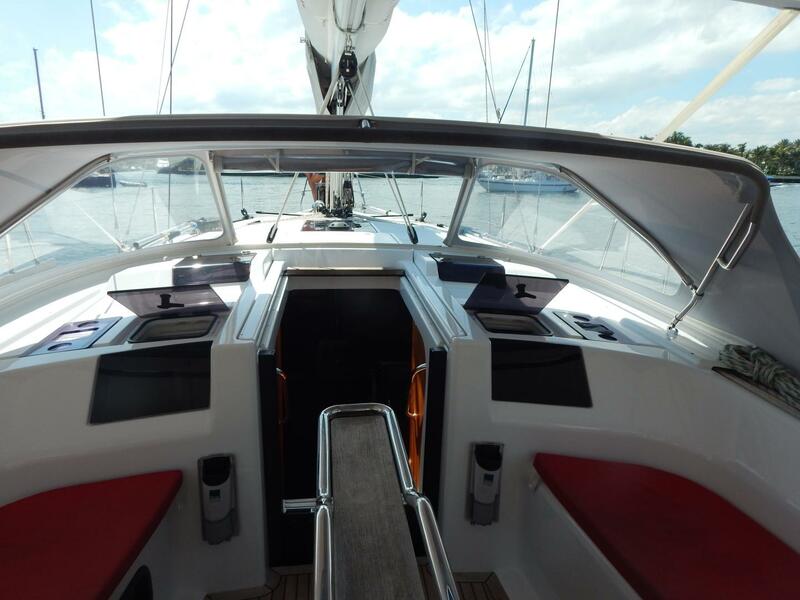 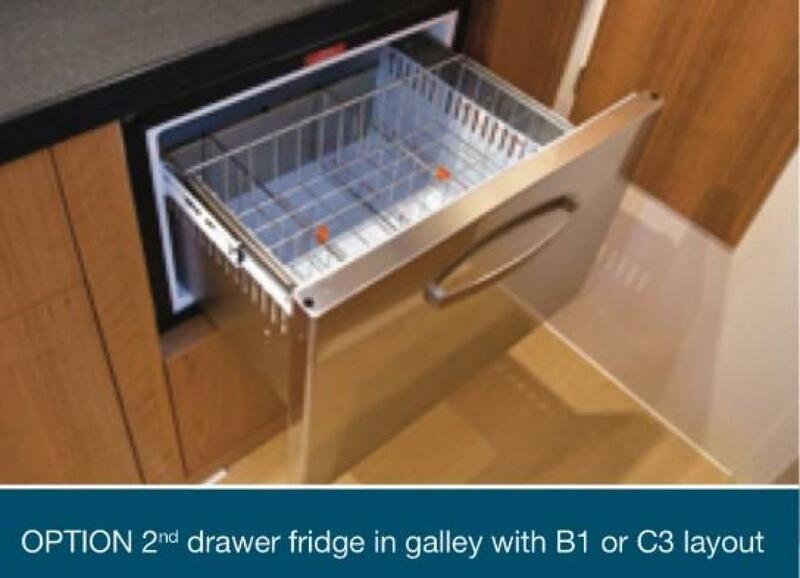 Upon entering the Salon – the Galley is to Starbd, and the head is conveniently located immediately to Port. 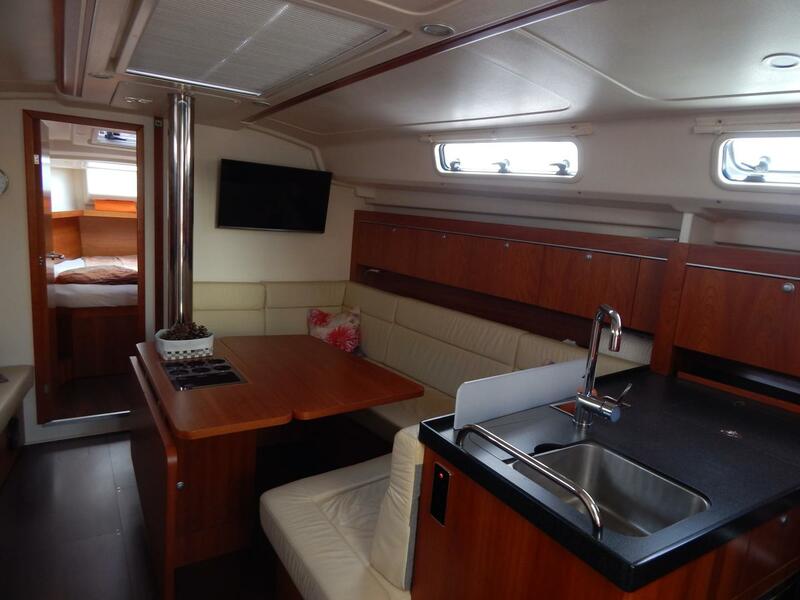 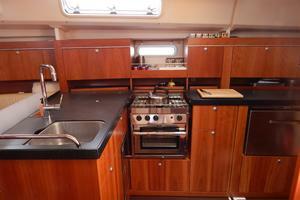 Forward of the Galley, on Starbd side is a comfortable dinette for eating or use of the table for other functions. 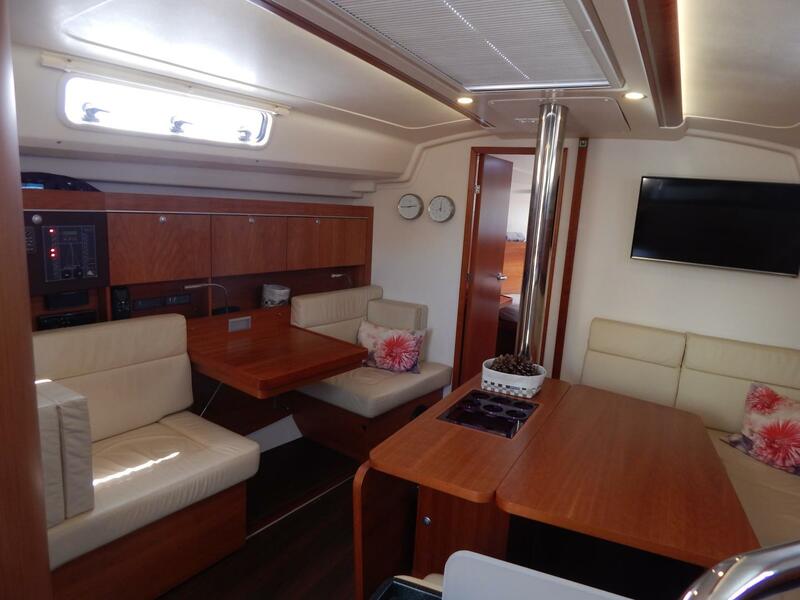 A full-Length Settee is to Port, and also has an integrated table (which lowers to form the full settee) and can be used as a Nav Station. 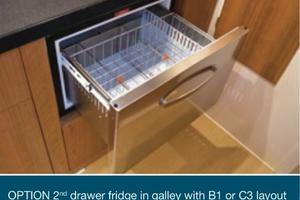 Inside instruments are convenient to this table. 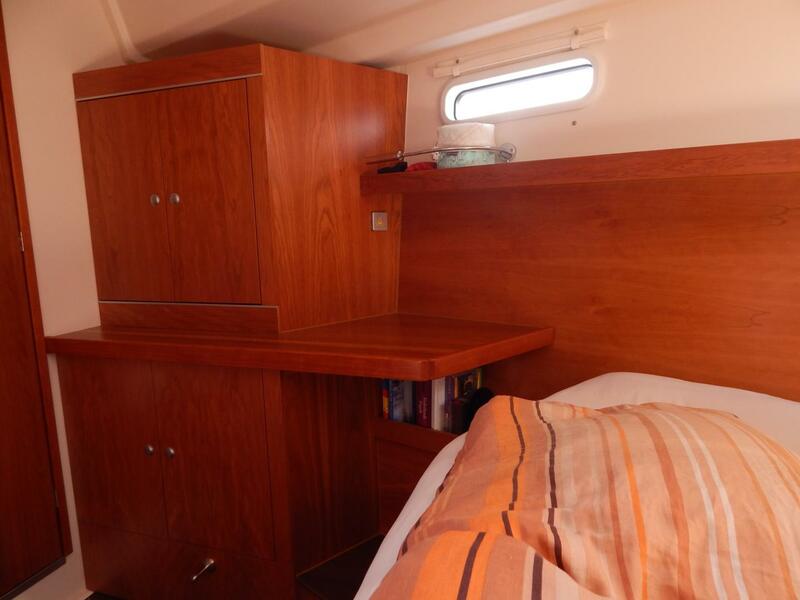 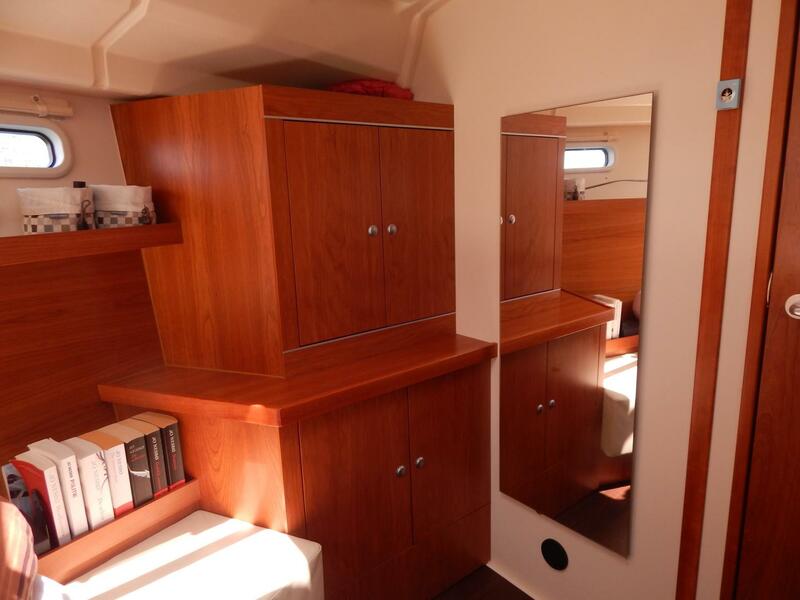 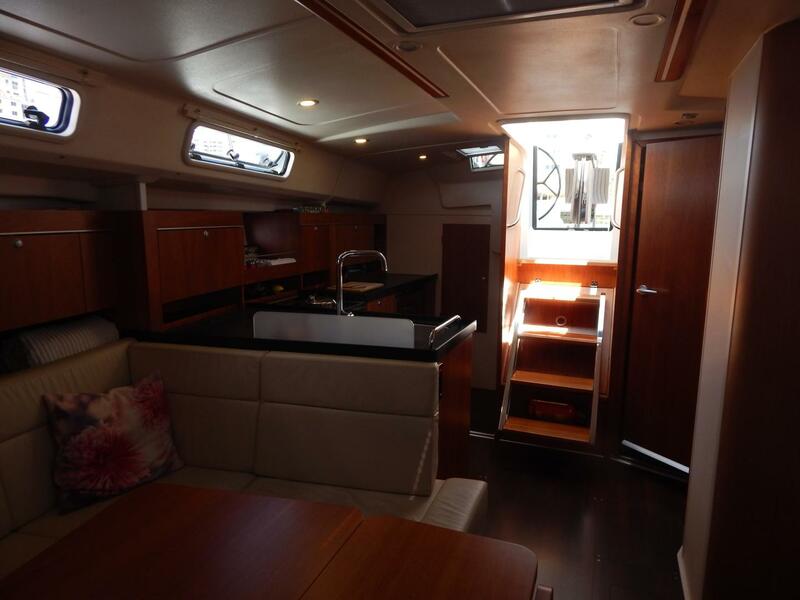 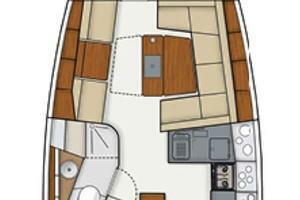 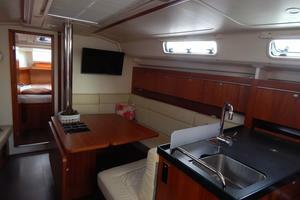 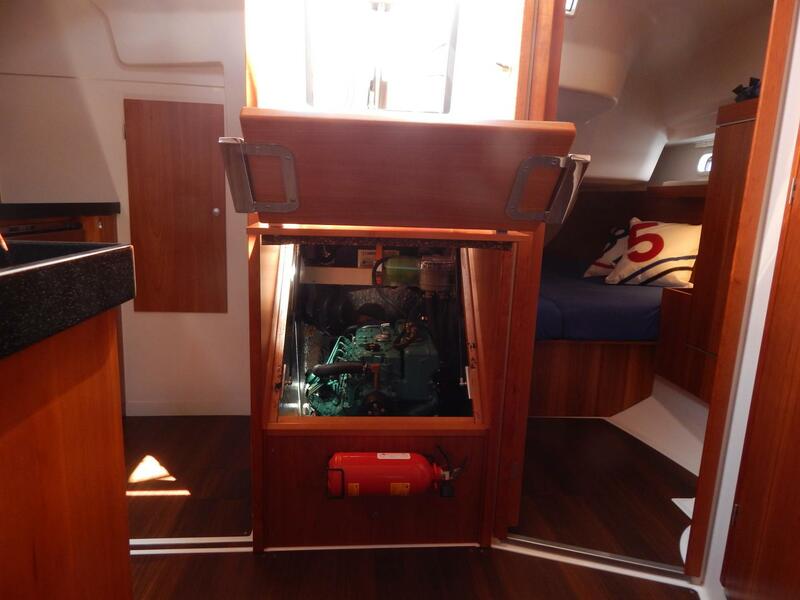 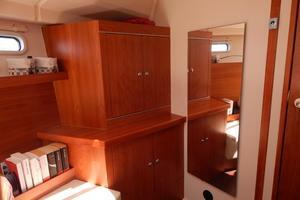 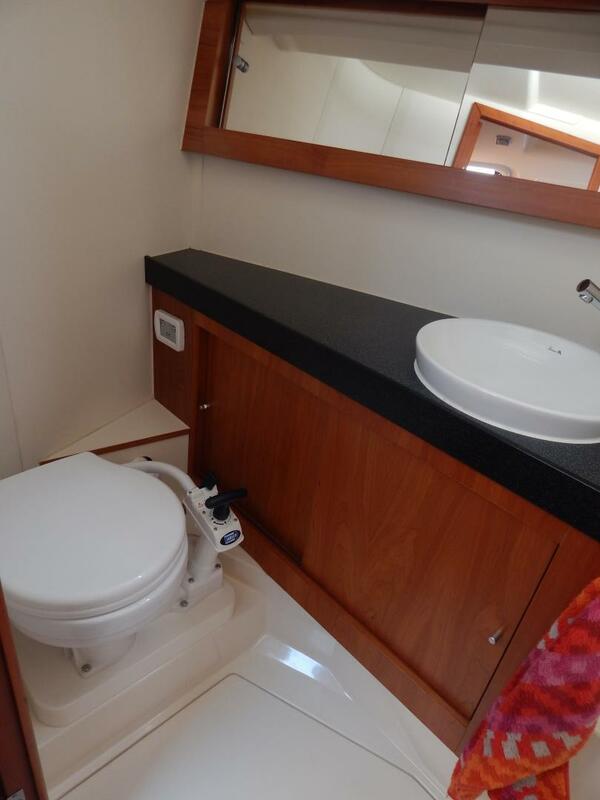 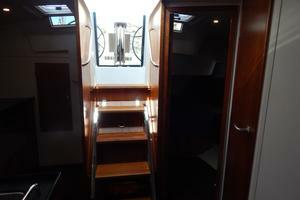 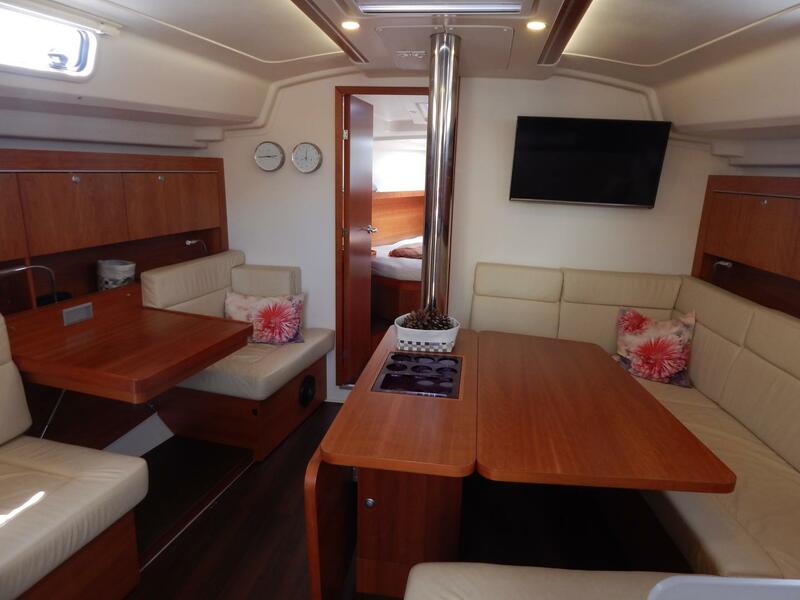 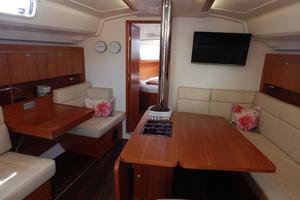 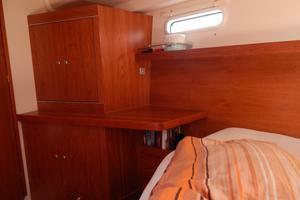 Forward through the Salon is the Master cabin with a Queen sizes berth and loads of storage lockers. 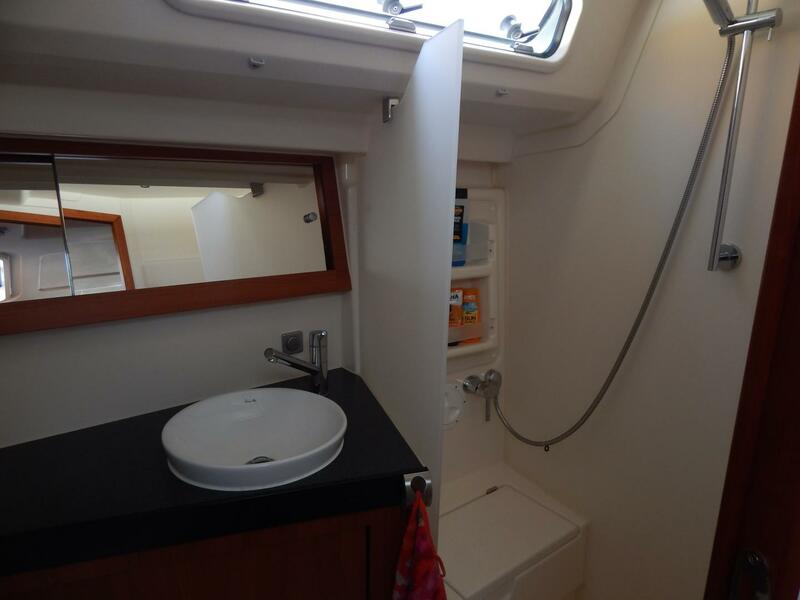 A unique feature is the oversized storage garage aft along the Starbd hull. 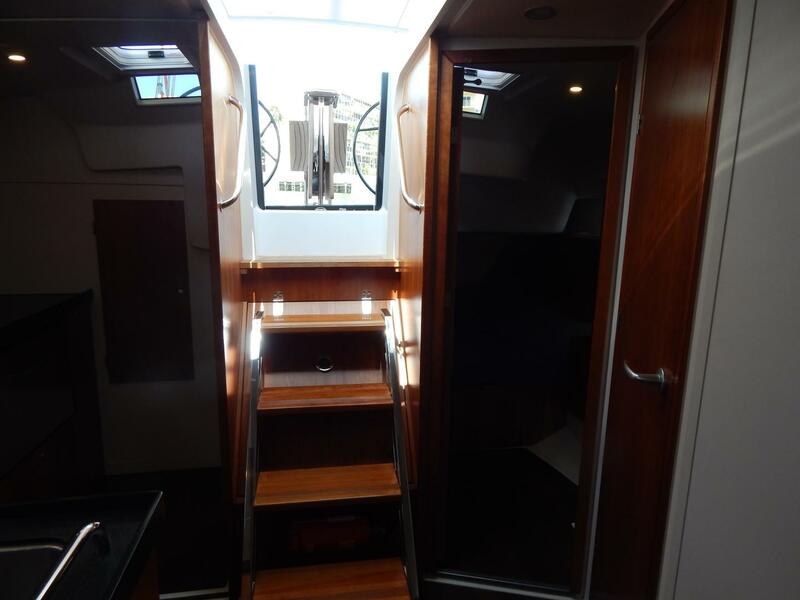 This large storage space can be accessed from either the cockpit, by lifting the Starbd seat, or from inside through an opening door. 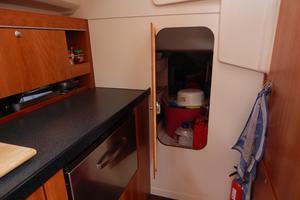 This is a huge storage space, and the inside access makes it even more functional. 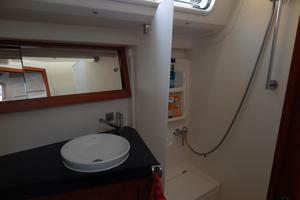 Salon: Salon is open and spacious with good lighting and opening hatches and ports for ventilation. 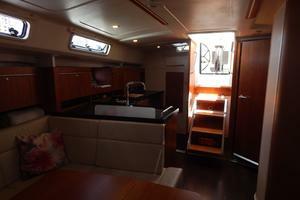 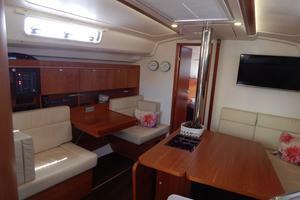 It features a Dinette to Starbd, and Settee to Port. 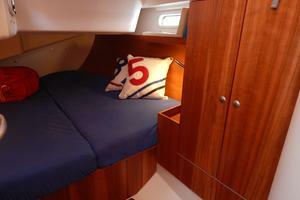 The center of the Settee is a unique table that can be raised and used as a Nav station or lowered to make the full-length Settee. 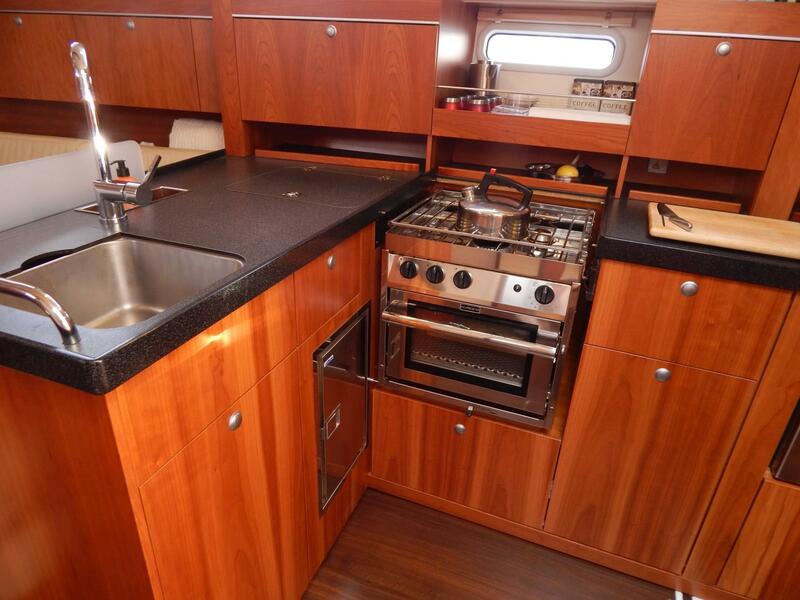 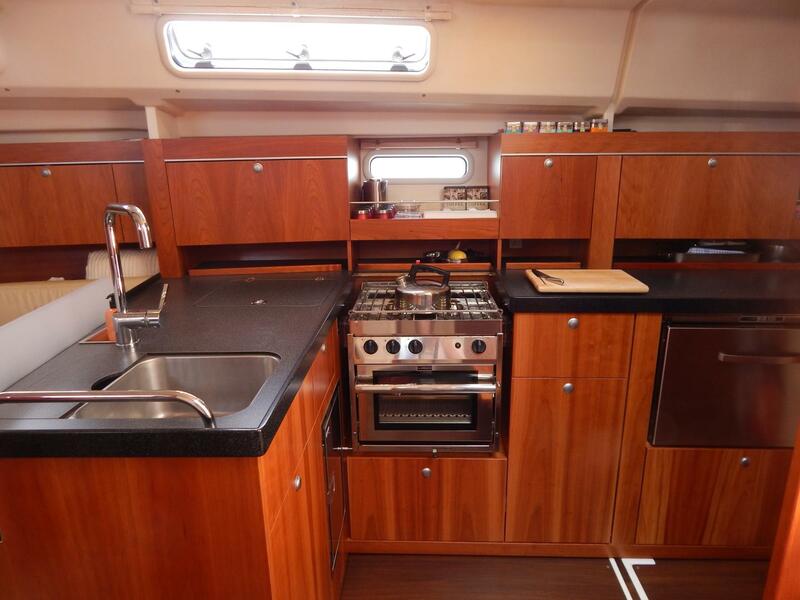 Galley: Large L-shaped counter, tastefully hidden refrigerator compartments (2) SS sink and stove, lots of storage; make this a complete cruising galley. 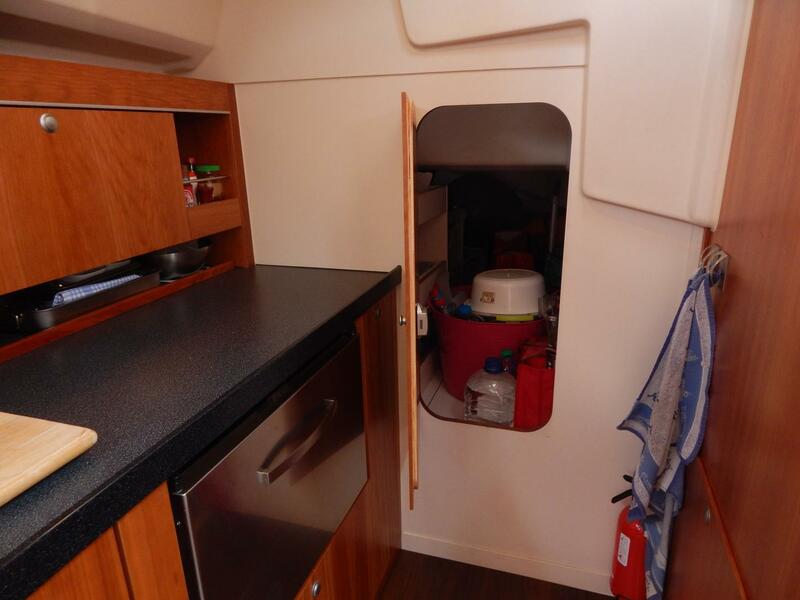 A plus is the interior access to the huge storage locker aft on Starbd side form the galley area. 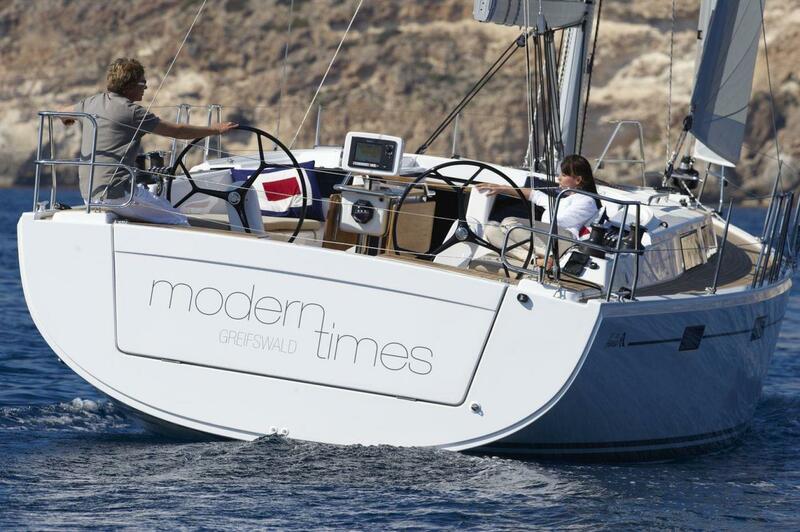 The sailplan has been maximized for efficiency, ease of handling, and makes this boat an exciting and excellent performance sailing vessel. 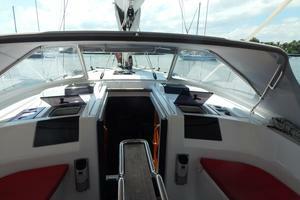 perfectly balanced and has a high degree of stability. You can sail safely and with confidence in changing and challenging conditions. 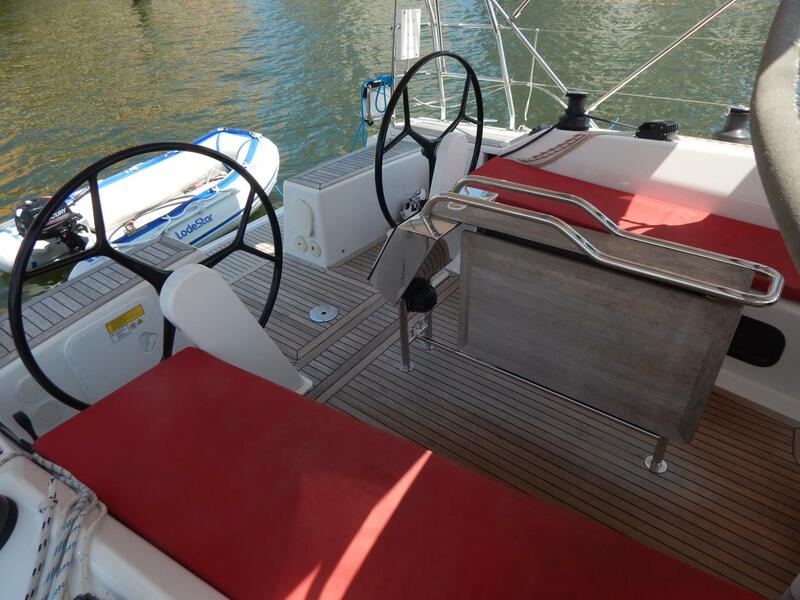 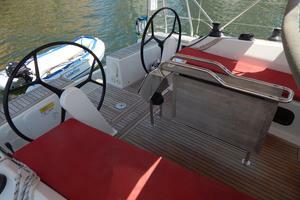 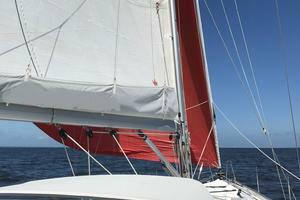 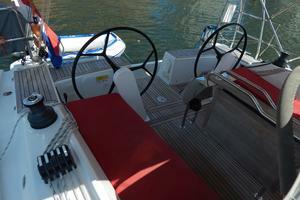 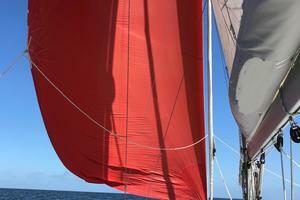 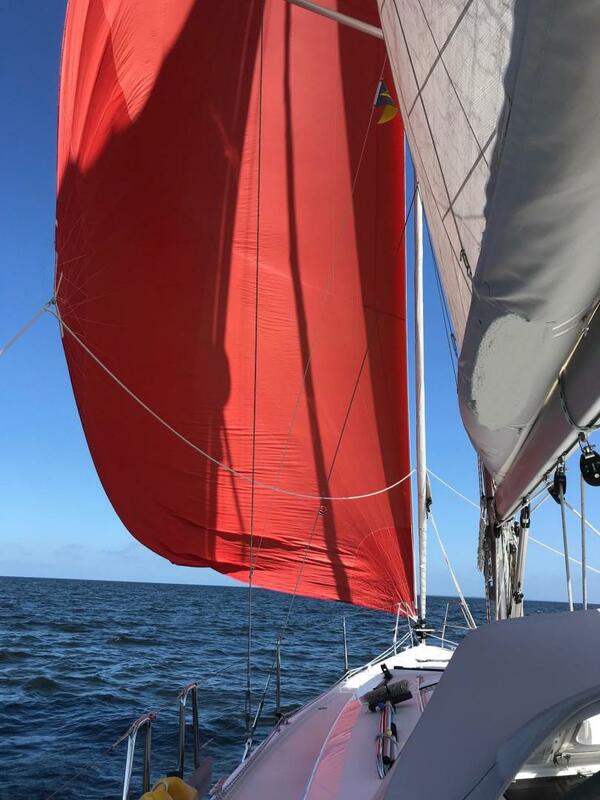 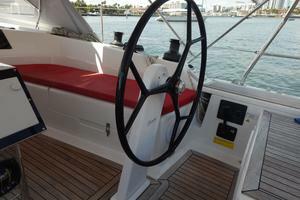 single-handed if you wish, as the helmsman can operate the sheets, halyards and reefing lines with ease from the helm. 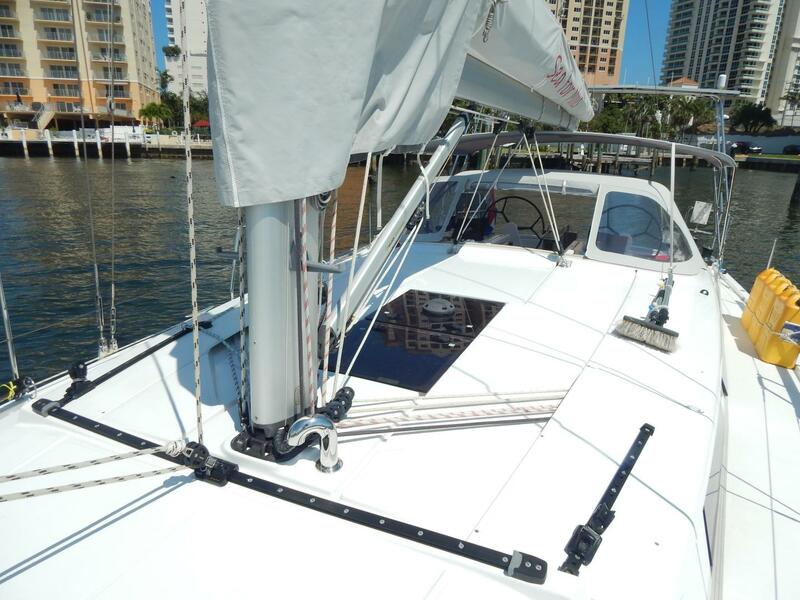 The cockpit is clear of all running rigging. The deck of the HANSE 415 is conveniently free of all running rigging and obstructions, allowing you plenty of space to relax and enjoy the beautiful surroundings of your favorite anchorage.